It is time for another (17th annual) Agram Arena Summer Tournament! 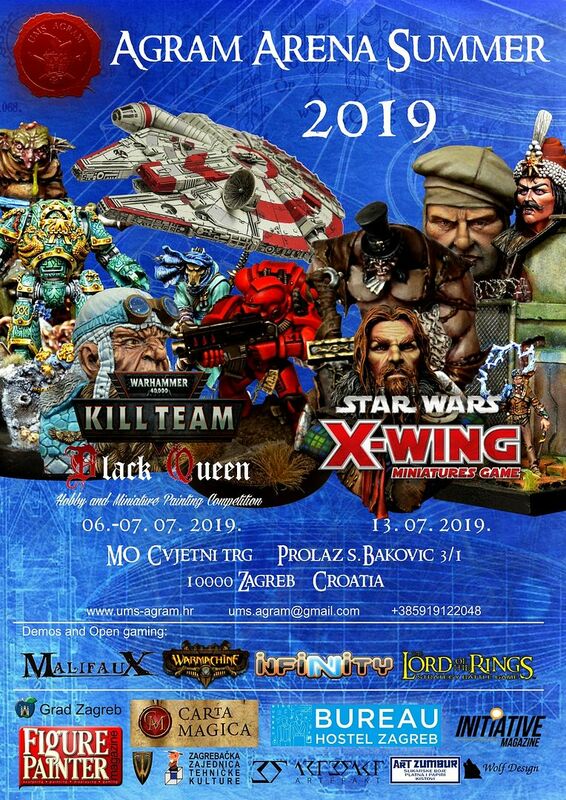 06-07.07.2019. International Warhammer 40.000 KILL TEAM Tournament + Hobby and miniature painting competition Black Queen + demo/open gaming (Infinity, LOTR/Hobbit SBG, Malifaux & Warmachine)! Accommodation for Saturday night is also free for the 1st-time-comers (read more in the rules)! Everyone else can be booked for the price of 13€ for the nights 6/7.7. and 13/14.7, and 18€ for every other night you might need. The Hostel is in the centre of the city, with parking ensured and only 5 minutes walk from the venue. After the end of the registrations of each respective event (June 5th for Kill Team and BQ, June 12th for X-Wing) it is no longer possible to cancel your accommodation and you will be billed for the accommodation at full price (18€ per night regardless of any discounts you might be elligable for). Also, the room assignements will be done once the registrations are final as we are not a tourist agency.